SF Greens are moving to a new office space in the Redstone Building! We now have a shared office, and will hold monthly meetings and events there. The Redstone Building is at 2940 16th Street, near the 16th and Mission BART station. We will hold most monthly meetings in room #302. The building is accessible, with an elevator. Our mailing address, however, will not change. We are having an office warming after our first meeting in the new space. On Wednesday, March 26, from 6:45-9 pm, we will make additional endorsements on state and local propostions for the June election, as well as candidates. Update: we will start a little early, at 6:45, in order to interview David Campos for the Assembly race. If you want to ask him any questions, be sure to show up at 6:45 or a little before! After the endorsements are finished, we will celebrate the opening of our new office! If you can, bring a small dish or beverage to share. New members and guests are most welcome! This is a report card for the 2013 Supervisors. 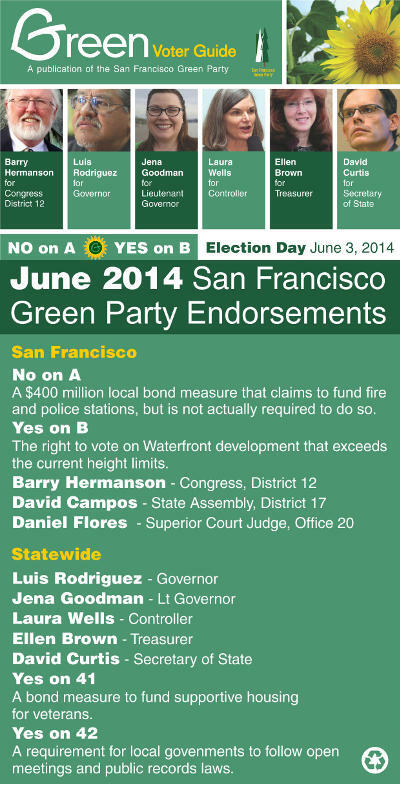 It shows the most important votes in 2013, from a Green Party perspective, and whether each supervisor supported or opposed our position. Some of the votes are on amendments to legislation. It was difficult for us to pick legislation to score this year, because the Supervisors were unanimous in the vast majority of their votes. All too often, the Board served as nothing more than a rubber stamp for Mayor Lee. For example, in one boondoggle revealed by Weekly reporter Joe Eskenazi in a recent article, Mayor Lee ordered $38 million in failure-prone hybrid buses, which were paid for and arrived in Alameda weeks before an oblivious Board of Supervisors voted (unanimously, as usual) to authorize the purchase order. While several Supervisors scored well this year, a Greener Board of Supervisors would be much more proactive about pushing for things that benefit working people, such as passing a Living Wage mandate, creating a municipal Bank of San Francisco, fixing Muni, building truly affordable housing, and creating more municipal utilities (e.g., public power, internet, and cable TV departments). As demonstrated by Matt Gonzalez in 2000, or Kshama Sawant in Seattle several months ago, the election of just one radical to a legislative body can really shift the political spectrum. We hope such people will step forward to run for office in SF this November! Find out which Supervisor represents your neighborhood. Compare to our report card from 2012. The SF Green Party will host a candidate forum this Wednesday, 9/25--come ask questions to candidates in the races for D4 (Sunset) Supervisor, City Attorney, Assessor, and Treasurer. The forum will take place from 7-9 pm in the Community Room at the Taraval/Parkside Police Station, 2345 24th Ave, in the Sunset. The event is open to the public and all are invited! Note that we do not currently have questionnaires for the other citywide contests; all candidates from those contests were invited.